This post has been in the back of my head for more than six months. It was last year that I came across some public ‘information’ about the Forest Street gate installation that bothered me. My sense was that Canadian National Railway (CN) was taking advantage of the ‘system’ to pad their profits, or at least minimize their costs. I’ll outline what I found and how I interpret it. I may be wrong, but after mulling it over for the last few months I still feel taken advantage of. The issue seems to highlight the difference between what is ‘right’ and what is ‘allowed’. Each of us has our own sense of what is ‘right’ and what is ‘wrong’. For big business it seems there is really no ‘right’ or ‘wrong’, it’s more a case of whether it’s profitable and whether it’s legal. And when it comes to legal it’s often the case that companies shop around for a legal opinion that aligns with their ‘interests’. On occasion the issue comes to court where the interpretation of what is ‘legal’ can be different. 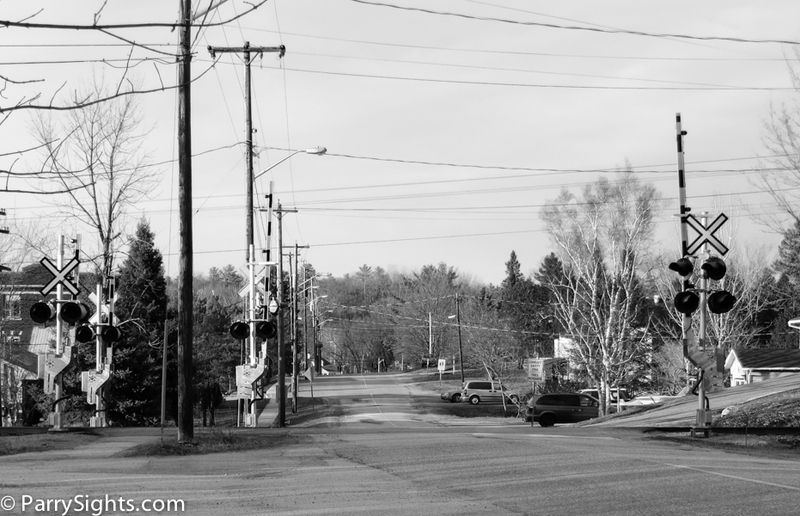 In the Fall of 2011 Parry Sound saw the installation of railway crossing arms at the Forest Street crossing. This street crosses a track that is ‘owned’ and maintained by CN (or does the track cross the street?). The crossing already had signal lights, so this installation added in crossing arms and the necessary controllers. In addition crossing arms were provided for the pedestrian crossing. The sidewalk is regularly used by pedestrians and individuals on motorized scooters. The actual installation of the crossing arms was subcontracted. CN presumably oversaw the installation to ensure the job was properly done. The arms that were installed along with the corresponding control units were purchased from a company in the USA. So far, so good. The installation seems to have been properly done. There are no issues that I am aware of with respect to the new arms. The cost for the installation of this type of safety equipment is shared by the Federal Government, the local municipality and the railway whose line is involved, in this case CN. The costs are shared 80%, 12.5% and 7.5% respectively, with the smallest amount, 7.5%, covered by the railway. This may seem to be a strange logic where the public, federal and municipal, is largely responsible for covering the cost of safety equipment to support a private business, in this case CN. The total cost for the Forest Street crossing arms was $242,884.75. This means the Federal Government’s portion was $155,020.35, Parry Sound’s was $54,915.25, and CN’s was $32,949.15. The information that was provided to Parry Sound to support their part of the expense contains considerable detail on the various components of the total cost. This information is available to the public. It was while reviewing the supporting invoices that I found something that didn’t feel ‘right’. Let’s remember that installations like crossing arms enhances public safety, something that should be of concern everyone. Even CN should be interested in enhancing safety. Less accidents mean less delays and less investigations – all of which cost them time and money. It would also seem to be good public relations to continually improve the safety of their operations as they increase traffic, noise and pollution. Yes more rail traffic means more pollution even if it is the lesser of several options. Here’s a summary of how the costs add up to the $242,884.75 total (from the CN invoice to the Town of Parry Sound). The detailed costs are worth examining a little closer. 1. Labour costs all had a 97.80% overhead charge tacked on. This doesn’t seem unreasonable – there are benefits, pension and other costs associated with staff. 2. Material from stock was assigned a 50% overhead. This seems a bit on the high side from my perspective. But lets let that slide, the total cost for these materials, before overhead, was only a couple thousand dollars. 3. All purchase order items were marked up a flat 50%. This is where I start having an issue. Sure the small items like $63.32 for ‘Heat Shrinkable Label for #16 AWG Wire’ makes sense. There are ordering and receiving expenses. 4. One of the purchase order items did ring a bell. The ‘Safetran Package’ which cost $103,366.59, was marked up 50% as well. This added $51,683.30 to the total bill. This is actually more than CN’s portion of the total bill. 5. Other Costs were marked up 3%. This included the services provided by the contractors that did the actual installation. From what I can tell the Labour costs listed earlier were for one or more CN personnel to be on site for the installation. My issue is with the 50%, or $51,683.30, up charge for the Safetran Package. It strikes me as excessive, almost to the point of being abusive. This is not to suggest it was illegal or inappropriate, but perhaps taking advantage of the system. It’s one of those charges that if a business is permitted to charge, they will charge. Sort of like a company charging a 20% return fee, even if it’s a defective item. Yes, it’s published policy, but is it good business? Probably not, there are always other companies that are happy to take your business with more reasonable return privileges. But when it comes to the railway, they set the price and that is that. There is no one else who can bid on the job. It can be argued that the railway has internal costs for the installation. These can include writing purchase orders and receiving materials. Ordering the Safetran Package might also have required some staff time to establish the order specifications. But come on now, $51,683.30 worth? That upcharge added about $6,500 to Parry Sound’s part of the bill, and $41,346 to the federal bill that we all cover one way or another. And in the meantime CN reported net income of $2.68 billion on revenue of $9.92 billion in 2012. Aren’t you glad that Parry Sound was able to do it’s bit to add a little more to the CN bottom line? No, it’s not illegal, it’s probably not immoral by most any business standard, but as a resident of Parry Sound I feel as though I’ve been hosed down. Yes, I have the right to feel however I wish, but with time I think this type of business will not be acceptable. If you operate your business at the expense of individuals and communities you need to take on a greater part of the responsibility. Do you think that the residents of North York were provided with a bill to put a chain link fence around Pearson Airport to ‘protect them from the airplanes’? But if we want more crossing arms in Parry Sound, or if we think a fence along the railway would improve safety, we need not only to pay our portion we also need to subsidize a hugely profitable industry. And if the railways are required to cover part of the cost they can always get it back by up charging materials and services. A suggestion; read the 2013 CN Annual Report. The overall theme is how we (CN) had a great performance in 2012, and really don’t know how we can do better in 2013. There are two groups to whom they feel responsible, their customers and their shareholders. Read on a little more and there is mention of how they are becoming more environmentally responsible. But there is very little mention about their responsibilities to the communities they run through day and night. Monopolies are wonderful for business. They allow companies to dictate the rules and everybody falls in line. In theory government has regulatory control over the railways, but they rarely use the power. While the civil servants may see the need for change and improvement they are led by the politicians. What politician would ever want to get on the wrong side of the railway industry? It will change with time, everything does. Perhaps with Lac-Megantic we will see the start, but I rather doubt it. Introducing policies to reduce derailments only scratches the surface of improvements that need to be made to limit the negative impact the railways have on local communities like Parry Sound. From experience, many specialized industries have a standard markup rate approaching 100%; 50% is actually lower than I would have expected. This additional amount is partially because there are very few competitors, but it also is padding to consume warrantee claims and compensation for having to carry expensive inventory. What I think is worth examining is the tendering process which is where I would consider the best judgment of what is fair or not fair. There are several smaller contractor rail maintenance companies who might bid on jobs like this. Maybe they could be sought out and invited to bid. Was the tender properly and clearly described and openly advertised to a wide audience allowing ample time for competing businesses to return quotation? Were there adequate responses made and were all considered carefully by knowledgeable and objective people? If so, it should return a quote that is reflective of market conditions. As far as crossing lights and gates are concerned, it is my opinion that due to their enormous cost, they should be used sparingly for busy crossings only. Today it is difficult to find a crossing without warning lights and most even have gates. I find it absurd that we would spend a quarter of a million dollars to protect people who are too lazy or don’t value their own lives enough come to a complete stop before crossing a rail line. Look, listen, live; it is a simple concept. Now, as far as who pays for that quarter of a million dollars; that is open for debate. The way I look at it is that the road crosses the rail line not the other way around. The rail line clearly existed first and a road was built over it, people built houses and the population grew to the point of needing crossing barriers. In that sense, I don’t think the railroad should have to pay. Maybe spending a few dollars on driver education would be money well spent. After all, you see dozens of drivers stopping for the flashing yellow on Seguin Street; it is obvious that half of the drivers need a serious driving education refresher. I’m sure that would be cheaper than making crossings idiot proof. Ah, and I guess you may be a fan of the Darwin Awards. True libertarian thinking. But it’s worth considering a couple of your comments. Regarding inventorying costs – there were none. The units were ordered in time for installation. The freight costs were billed separately, a few thousand. Your suggestion that ‘lazy’ people don’t don’t deserve protection (my words) leads to some interesting extrapolations. So anyone drunk who injures themselves shouldn’t receive medical treatment? They should have known better. And of course anyone obese similarly shouldn’t be eligible for any type of medical support, because we all know they were ‘too lazy’. This could go on but I’ll cut it short, I don’t agree and the more examples that I raise may just suggest otherwise. But, doesn’t safety make economic sense? If we can pare costs down to where no one is making a ‘profit’ on the installation of gates, we are closer to $200K. And if we don’t help prevent accidents it doesn’t mean that accidents won’t happen, they are likely to occur more often. That implies medical care costs. Not all accidents are fatal, and they don’t always involve a single individual. Add up the medical costs and you can make an argument that gated crossings can save money in the long term. The social benefits of promoting safety are just a bonus. At the risk of offending some, I truly do not wish to: dealing with the railways gives one a sense of the frustration that has been experienced by our First Nation citizens. It doesn’t really matter what has been agreed or what is ‘right’, the best business policy for the railways is to stall and obfuscate. Let’s see how the Lac-Mégantic expenses are handled, already the railway is pushing back on expenses. The ‘people’ who run Montreal, Maine & Atlantic Railway are really no different than the executives that run the major railways. They are all men, all put on their pants one leg at a time, and have the same incentive to maximize profits, regardless of the collateral damage. It’s always cheaper to treat than prevent in the business world.